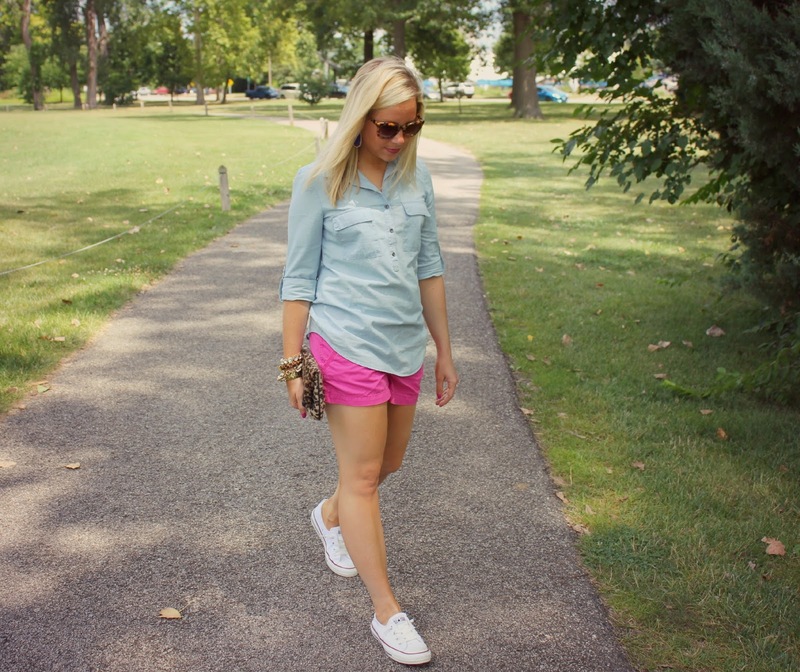 Today I am linking up with Sam from La Petite Pear in her series Fashionistas in Flats! When I wear flats I always like to find comfort! Some flats tear up the back of my heal and then I can't wear any type of shoe for days or I am covered in band-aids. My converse are my go to comfort shoes! I wore these while on vacation in Boston and they were so comfy! Love that I can pair these with anything! Love my converse! Stay tuned for tomorrow! Elle from Living in Color Style and I are going to be Hosting a link up! We will be hosting a weekly link up called "Spotlight of the Week". The spotlight of the week is "Stripes". We would love to see how you styled your stripes look! 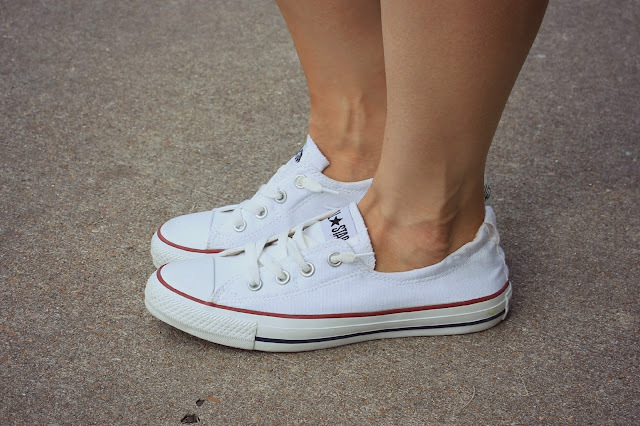 I love this simple look....converse sneakers are such a necessary staple! Thanks Kierra! Love comfy days! Love love love that clutch! Love the combo of dressy and casual. Those shoes are the best. Thanks Nicole! Love these shoes! Love the Chucks! Perfect casual outfit! Thanks Debbie! One of my favorite shoes! Thanks Emily! This is my second pair of chucks and I love them even more now! Your Chucks are adorable with this outfit! Such a cute, casual summer look! I swear by my white converse sneakers. Love how you incorporated animal print into a simple casual outfit! That plus the sneakers make it so fun! Thanks Krista! Love adding leopard to my outfits! This is such a perfect look! I can totally see me wearing this out and about every day! Love the casual looks lately! Thanks Kahana! Love casual days! So adorable! And I just wrote yesterday about how I was thinking about getting some sneakers and then you show me how cute you look... Now I really think I need them. Love the clutch! I saw! So funny! You should def get a pair! Thanks! These shorts are super old. I just love them too much to part with them! Love this color pink! Thanks Lauren! Love comfy shoes! Thanks Kayla! Thanks for reading! Thanks Adriana! Love comfy shoes! The sneakers are perfect with this look....they look super comfy! I don't think this could be any cuter, love the bright pop on the shorts and I am addicted to converse with EVERYTHING! if you could email me back that'd be awesome! I love this look and I've really been meaning to try it out myself. I've had my poor white chucks sitting in the closet for far too long. So cute!! Arm candy and animal print clutch goes very well together! Me likey! love your clutch & white converse are totally on my wish list!